Until the middle of her sophomore year of college, Hana Caster had defined her lacrosse career by scoring and setting up goals. She scored more than 100 points her senior year of high school alone, but her coaches at UMass Lowell saw something more in her game and moved her into a new, defensive role. She is no longer counted on to score goals but to try and prevent them. It was admittedly not an easy transition for the former North Attleboro star and 2016 HockomockSports.com Player of the Year, but with time Caster has grown into her new position and earlier this season was named America East Defensive Player of the Week, a sign of her growing comfort level and confidence in defense. “Yep, I’m a defender,” Caster said with a chuckle during a phone conversation following the team’s loss to the University of Albany in March. Right before practice at the midpoint of last season, the UMass Lowell coaches told Caster they had a surprise. She was no longer going to be in the River Hawks midfield but be the backer in their zone defense. Although she suffered a ligament injury in her foot that kept her out of fall ball, Caster was able to watch the game from the sideline, studying her new position, and came into this spring determined to be better and more comfortable in front of her own goal. As a former attacker, Caster uses her experience on offense to help anticipate what opponents are going to be doing. She can read the hips of a driving attacker, realize what she would have done with the ball, and jump the play to prevent the ball getting to goal. She can also use her new vantage point to give advice to the River Hawks attackers about what might work best. UMass Lowell coach Carissa Medeiros noted that Caster wasn’t originally on the recruiting radar but drew the attention of the coaching staff at a summer clinic that Caster attended the summer before her senior season at North. After the three-day clinic, Medeiros said it was imperative that Caster come back in for an official visit. The coach had no idea at that point she would be moving Caster from midfield to defense. “We had to convince her to trust us that her value is much more dynamic than that, and quite honestly, focusing on just that aspect of her game had been holding her back,” Medeiros said. Caster’s progress was confirmed earlier this season when she was named the America East Defensive Player of the Week. “I didn’t know that I could be noticed for playing good defense because I don’t notice that,” Caster joked. 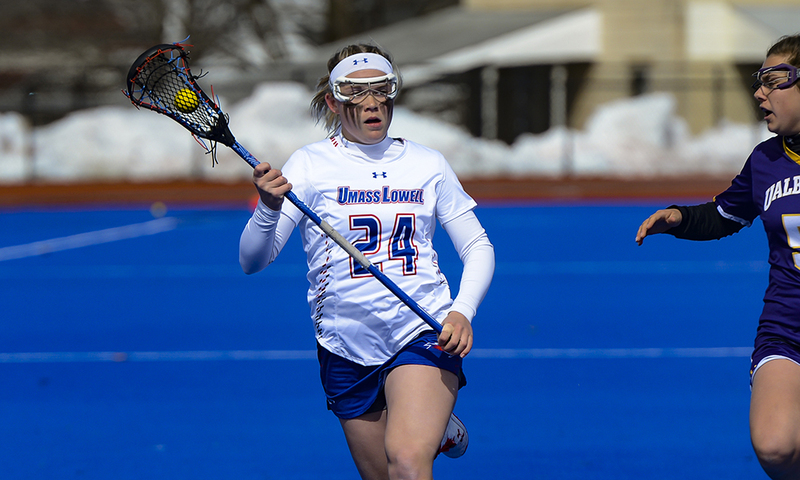 “It is gratifying to just know that I am in a good place and my hard work is paying off.” The River Hawks went 1-1 that week, and Caster recorded seven draw controls, six ground balls, and eight caused turnovers. While UMass Lowell is a relatively young lacrosse program, having only started in 2015, Caster entered this season in the top 10 all-time in career goals, assists, points, ground balls, draw controls, and caused turnovers. She has found success no matter where the River Hawks have lined her up, but Caster said that it took time to get her footing at the collegiate level. The River Hawks have struggled during their first few seasons, having only won 12 games all-time coming into 2019. Having top 20 teams like Stony Brook and Albany in the conference certainly doesn’t help the growing pains of a new program, but Caster appreciates the challenge of building a new legacy in Lowell. She had a similar experience in North Attleboro. Her senior season, in which she scored 61 goals and led the Hockomock League with 46 assists, was the first time that North hosted a playoff game. The Rocketeers opened the playoffs with a win before losing to eventual state finalist Walpole. That season helped change the expectations around the program and Caster wants to do the same in college. “That’s one of the biggest why I came here to play,” she said. “I like being the underdog and I loved my high school career and loved leaving the field for the last time and feel like we started something here.